I’ve got a new painting in the works & I’ve been playing with some ideas in pen & ink, posting wip sketches over at Instagram. I thought you all might be interested– I’m planning to share some painting process shots there too. Have a look if you like! (You don’t need an Instagram account to see my page.) 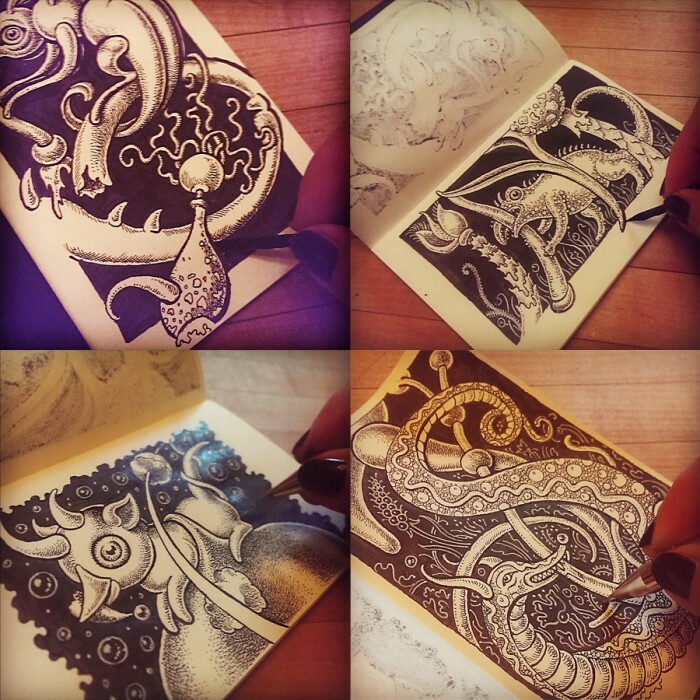 These are done in a mini Moleskine sketchbook, with India ink & a Hunt 108 flexible crow-quill pen. The backgrounds are painted in with a Pentel brushpen, & white details added with a Uniball Signo gel pen. This entry was posted in Sketches and tagged Characters, Dip Pen, India Ink, Moleskine, Organisms, Pen & Ink, Pentel Brush Pen, Sketchbook, Uniball Signo on 20May 2015 by Leah. Love these monochromatic ones! Your renderings are lovely….. Thanks so much, Clara! Pen & ink was really my first art love. It still makes me happy, although I rarely show my sketchbooks. very nice , I like it a lot !